If you've ever tried connecting a keyboard to your Android, you will most likely have run into issues with the keypad layout. If you're not a US layout user, this will affect special characters keys as well as result in mixing up Y and Z. If you're like me and are waving your fist in the air, enraged and shouting “Stop this madness!”, read on, because External Keyboard Helper Pro is our app of the week! Since version 3.0, Android supports Bluetooth and USB keypads, but this is far from perfect. On many devices the system assumes it is being connected to a US-layout, meaning that the keys are not in the correct position for users who are accustomed to working with other layouts. It will be challenging enough for French speakers used to working with the AZERTY, but those looking to use the Cyrillic alphabet will be in even more of a pickle. But—there's a solution: External Keyboard Helper Pro. This app automatically activates when you hook up to a keyboard, and in the best case scenario it will automatically connect to the preferred keyboard layout. Alternatively, you can make changes manually; the list of supported layouts is extensive. Ideally, all you would need do is install and activate the application so that you can then go straight on to typing away. Fortunately for some users, however, the app's scope is larger than that. If your keyboard is not set optimally, you have the option of adjusting individual keys and assigning them functions, characters, combinations and even apps that will start up when you hit the key. So, for instance, when you hit a certain key the volume adjuster will pop up, another will allow you to adjust the screen brightness, while yet another is assigned to the gamepad. The same goes for often-used functions such as copy, paste and insert. I was very impressed by this! 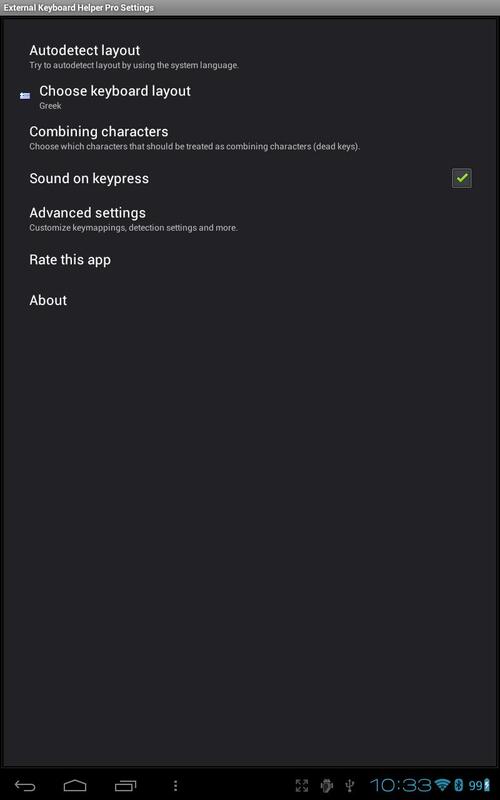 Go to advanced settings if you wish to turn the app into a connection of the input method's selection dialog, or else to activate a key that can help you switch between up to three language layouts. It may happen that the app accidentally assigns new hardware keyboards to the device. This can be prevented using the device filter ID: simply enhance the filter until you're rid of such glitches. In most cases you won't have to deal with anything of the sort, however. 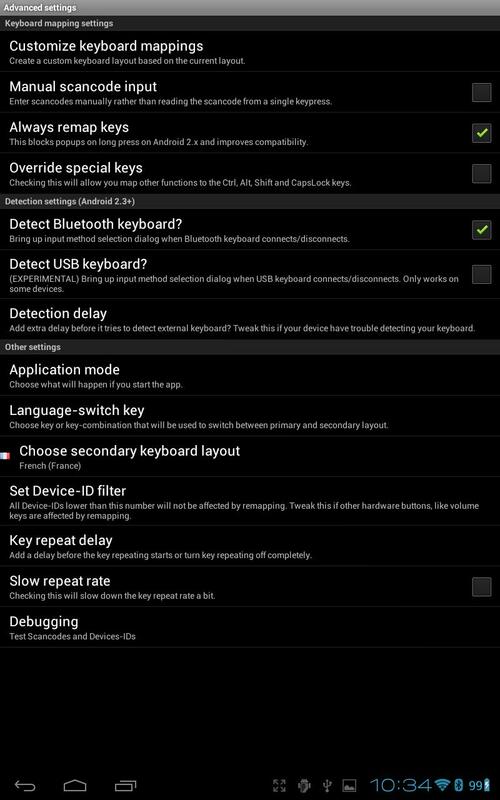 External Keyboard Helper Pro is a function-packed application that allows users to personalise and modify their keypads for Android, and it allows you to completely circumvent annoying and ineffective on-screen keyboards that swallow up half the display. It's also ideal for non-US layout users. The drawback: controls. More details on that below. External Keyboard Helper Pro has some excellent functions and settings options on board, but we came across a few bones of contention in this category. First and foremost, the app is not ideal for newbies. There's no tutorial to help guide new users through the rather complex functions. Even Android pros might be taken aback by the sheer number of settings options. Reading through the three page info section – tips for starting out, FAQ and documentation – can take a while. A more easy to navigate UI wouldn't even have been that difficult to achieve. The Ubuntu installation menu is a great example: when installing, simply hit a few keys and the layout will pop up automatically. Layouts can then be displayed within the app. Hit a key on the screen and a menu pops up allowing you to change a key's function. 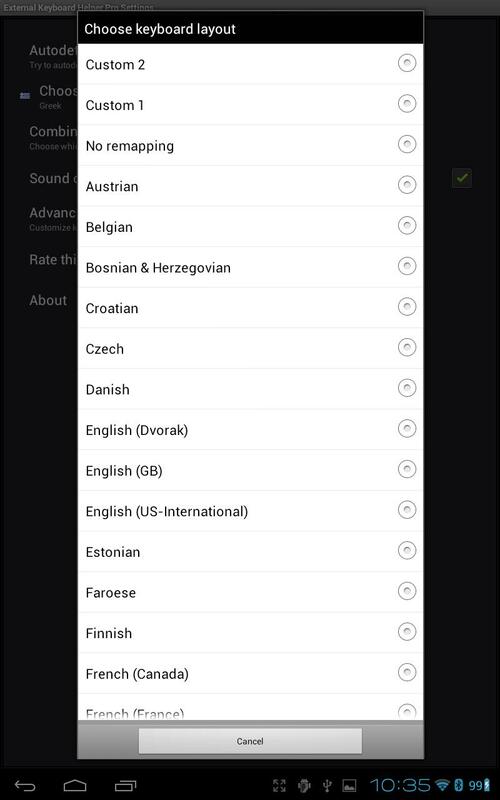 A sub-menu could be used for advanced settings (such as a device ID filter). External Keyboard Helper Pro runs without any issues. External Keyboard Helper Pro is our app of the week and available for only €1.09 instead of €2.26. A fair price considering the amount of settings.